When you think of the word meditation, what pops up in your mind? A big banyan tree with cascading roots and a saffron robed, crossed-legged, bald guy feeling at one with the universe? Ha ha or this poised image of me whilst pregnant with Alice-Ateyka imitating the social media hysteria of meditation! This image was taken to prove the point that I would never ever mediate if this is what I would aspire to. Meditation mostly happens while everything around you is melting in hoards of chores, screaming kids, washing-up and blog posts to write, you gently start to focus on and notice your breath. The more you focus, the less shallow it gets and the spinning world around you slows down and in the following moments, you rediscover your priorities and options? It’s this vast chasm between the supposed look of meditation and the actual way it works that creates the biggest barriers to start your meditation practice, in my view. Rationalising our fear that stems from not being able to commit to the bald guy version of meditation, is what we do well. We have no time, no space, no flexibility to sit in the lotus posture…perhaps even the lack of dreadlocks is sometimes a good enough hideaway. On average, 70% of adults when polled to see if they would like to do more meditation answer yes, but approximately only 6% of them actually find the time and inclination to engage in it. If you fall outside of this minority of people and think meditation is either hard, needs special mindset, is for a certain demographic, requires commitment to a place, time or clothing…then you simply need to stop going to these elitist sources of information that pretend to help you but simply make things less achievable if you don’t follow the rules. Unfortunately, the internet has made everything into a competition these days. If you fold your pizza the wrong way there are social media repercussions. It’s so easy then to feel that, unless you sit in absolute stillness like this celebrity who clearly finds it effortless, any of your feeble efforts can’t be the real thing. My first advice to anyone who asks me about meditation practice, is to not make it into a “thing”. By this I mean, it’s not like the habit of brushing your teeth, that without the right room and the right equipment it’s not possible. Meditation is already a part of you. You take it along wherever you go, even when you are totally oblivious of its existence inside of you. It’s with you in the shower, it’s with you at the supermarket, it’s with you when your child lies down on the pavement and rolls on his white shirt… more like your hands are with you all the time. If you need to carry something, do you have to remember to take your hands along? The reason you don’t think about the use of your hands is because you are an expert at using them. You have got that way as a result of constant use and exploration of this tool/equipment from infancy. By the time you are a two-year-old, using your hands is a breeze. Just as a thought experiment, think of that infant/child who would be exposed to meditation techniques the same way – would they think twice before employing this powerful stress diffuser when they need it most? So, just like that infant who is exploring their hands, don’t wait for the right cot mobile to get started; get started now! So, stop reading for the next few minutes, look away from the screen once you have finished reading the instructions, and get started right here in the middle of this blog post along with tens of others. If you didn’t get to 10 without your mind starting to wonder what’s for lunch, then thats fine. Go back to it again in a few hours, even minutes, and see if you can get to 10. Once you get to 10, don’t increase the count; just increase the frequency of your practice. Doing three sessions of 10 counts will achieve more than one session of 30 counts. The longer you stay with 10, doing it more frequently, the better your foundations of meditation will be. When you get started, try to set the stage for your mind by practising your count in a low-stress situation. Once the mind consolidates the low-stress connection with your breath count, then every time it hears your counting it responds to the situation as if it were low-stress. A perfect trick to use at the supermarket meltdown situation – your brain will not know the difference. So you see, despite all the jazz about nirvana and eternal bliss, at the core of meditation lies a tool for everyday situations: simply teaching your brain to respond to something with the same calmness that you would need to apply when you are building a house of cards. If you are a Poirot fan then you know this life lesson already. Whenever he began doubting his capabilities or was lost for inspiration (which, by the way, is so easily blocked by stress), he would calm his nerves by building his card tower. It’s the same breath control for both activities. It’s the same technique of training your mind to respond calmly and not react as you would in the adrenaline-filled, stressful conditions. If you have been postponing trying meditation, and this post has encouraged you to try, I would love to hear your experiences. Let me know what happened when you tried it for the first time, let me know what happened the tenth time, let me know where it takes you. Every now and then I get questions from MummyYoga attendees that are perhaps relevant to many of you. So I thought sharing these conversations as blog posts might have a wider appeal. This morning, a lady sent me an email after her visit to her physiotherapist. I wondered if you might help me out a bit??? I had a physio appointment a couple of weeks ago because my lower back and hips are very sore and I’m starting to cease up after activity i.e. after walking home, after the relaxation element in yoga – there’s been a few times I thought I might need to ask for help getting off the mat for example. I’m hyper-mobile, which I new already, but with pregnancy this has started to impact my hip joints, as I’m sure you can imagine. My physio has suggested less walking and that I give up the yoga. I really don’t want to give the yoga up, as I think the breathing exercises and the core body strength poses we do are really good for me. I also really benefit from the upper body and hamstring stretches etc. So basically, I’m asking for a second opinion from you if possible? I’m happy to take direction during in class to ease off, don’t try this etc. but would much rather do that than give up completely. Any guidance on this would be much appreciated! Soreness that comes from hyper mobile joints is not uncommon and my suggestion in this scenario would definitely be a lot less dramatic than giving up the very things that keep you physically, mentally and emotionally well. I am glad you asked before giving up yoga. My opinion would differ from your physiotherapist. You are right about increasing strength with your practice. A lot of people are unaware of how yoga builds strength as well as flexibility. One of the first things people say to me when they join the classes is, “I am not flexible”. Now, they never say, “I am not very strong, and I don’t know if I will be able to do this practice!”. It doesn’t occur to them that they will also require and build strength with yoga. I hate this misconception. After years of being in the weight training/body building world, I can tell you yoga indeed makes you very strong. More importantly, unlike “weights at the gym” it makes you functionally and dynamically strong (like bendy grass) rather than simple muscular hypertrophy (like a big tree trunk). The issue with hyper mobility is partly exaggerated by lack of muscular strength. If your tendons/cartilages and muscles can stretch beyond the normal range of motion then it will need to be strong to counter that stretch. If you can’t “reign” them in with strong muscles you are in danger of injuring yourself. That injury does not always occur at the hyper mobile joint. It occurs at your weakest link in that movement. So, your gut feeling of continuing your practice is probably the better option, both for your pregnancy weight load distribution and postnatal joint health (pregnancy and postnatal hormones can have quite a destructive impact on joint health if not taken care of). There are plenty of variations we can try in class to limit the joint pain, particularly at the pelvis. One of the first things I would suggest as a blanket care is to not go too deep into postures simply because you can. We will work on foot positions and stance to build strength through the load bearing joints and muscles. The one other thing you can do is also not be static for long particularly after the practice. Use a seated position for the meditation element at the end. We can do a lot to manage your hyper mobility and ceased muscles without having to take drastic measures such as simply cut out one of the most beneficial things you can do in a pregnant state. So if you suffer from your muscles ceasing up after physical activity, don’t just give up. See where the issues lie and if there are simple modifications you can make to improve management. Impact of meditation in pregnancy – some scientific data. Yoga is the stilling of the changing states of the mind. Without stillness in thought, action and overall being much of the benefits of asanas will only be rudimentary and superficial. In order for pregnant women to gain all the benefits of her yoga practice, incorporating a vehicle that will influence calmness of mind and emotions becomes essential. Meditation techniques should therefore be introduced as early as possible during th e course of the prenatal yoga practice. There are distinct physiological advantages to meditation that may benefit both mother and child in the womb. In the influential The Relaxation Response2, Herbert Benson in 1975 showed that meditation (particularly he researched transcendental meditation) decreases various stress causing physiological responses (Fig. 1) such as heart rate, breathing rate, sympathetic nervous activity and other metabolic activities. Pregnancy rates at 44/100 in scale of impact of stress in a woman’s life, well above change in financial status (38) and death of a close friend (37).2 This means that active management of stress and anxiety during pregnancy will be of great benefit to both mother and child. Apart from stress management, meditation and in general yoga practice has significant benefits in childbirth and management of pregnancy related issues. Many techniques involved in meditation will also be useful during birthing itself, which may explain to a certain extent why women adept in yoga and meditation manage labour and childbirth better than their otherwise unprepared counterparts (fig.2). Despite all the mounting scientific evidence, one of the main reasons to prepare pregnant women with techniques in meditation is to empower them to take control of arguably the biggest situation in their lives. Women can only feel in control when they know how to respond to situations in a non-reactionary manner. But the even more important point to empower women with is in the knowing that giving birth is perhaps the greatest meditation technique we will ever have and thus to embrace it with all its power and humility and pure beauty. 1. Bryant, E., F (2009) The Yoga Sutras of Patañjali: A New Edition, Translation, and Commentary. North Point Press: New York. 2. Benson, H. & Klipper, M. Z. 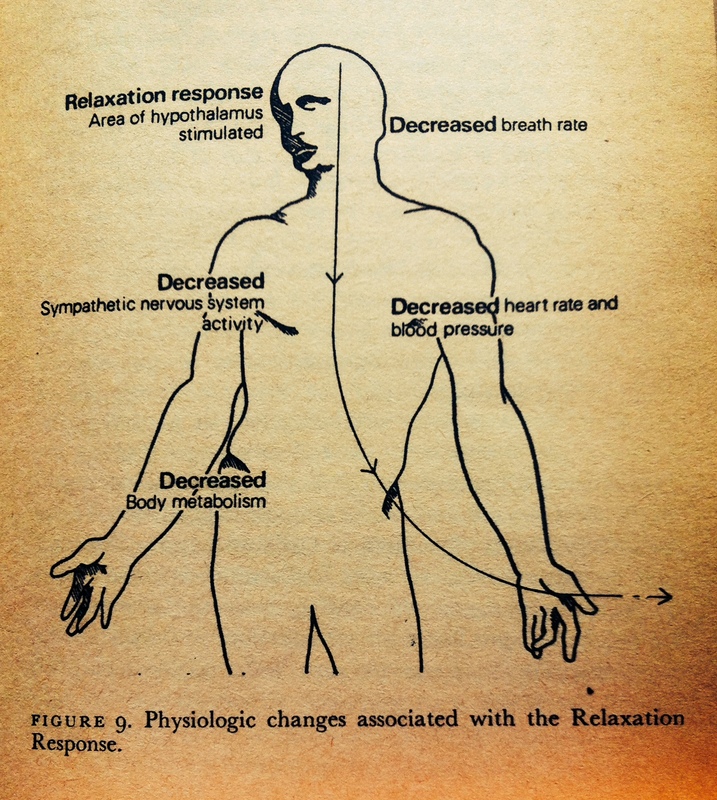 (1975) The Relaxation Response. William Morrow and Co. Inc.: New York. 3. Chuntharapat, S., W. Petpichetchian & U. Hatthakit, (2008). Yoga during pregnancy: Effects on maternal comfort, labour pain and birth outcomes., Complementary therapies in clinical practice 14(2), 105–15. 4. Tragea, C., G.P. Chrousos, E.C. Alexopoulos & C. Darviri, (2014). A randomized controlled trial of the effects of a stress management programme during pregnancy., Complementary therapies in medicine 22(2), 203–11.